Jumeirah Beach Residence, often referred to as “JBR,” consists of six community areas that outline the popular strip called The Walk. A beachfront promenade, offering a comprehensive retail mix of family casual dining, cafes, boutiques, hotels and more, The Walk is always abuzz with activity. There is little distinction between the towers that outline these six community areas as the exteriors to each are nearly identical. 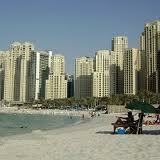 The six community areas that comprise Jumeirah Beach Residence are: Shams, Amwai, Rimal, Bajar, Sadaf and Muran.